[Note from Matzav Editor in comments section.] INJUSTICE IS SERVED: It is with pain and sadness that Matzav.com reports the decision of the jury in this case. We continue to daven for a yeshuah and we follow Reb Shalom Mordechai’s lead in placing our bitachon in the One Above. A jury has convicted Reb Shalom Mordechai Rubashkin of 86 federal charges for what they claim is his part in a fraud scheme at the Agriprocessors Inc., in Postville. Jurors declared Reb Shalom Mordechai guilty of bank fraud, making false statements to a bank, wire fraud, mail fraud, and money laundering and aiding of abetting. The jury found him not guilty of five counts of violating a law requiring payment of livestock providers within 24 hours. (See an accurate overview of the case here.) All Yidden are asked to recite Kappitel Nun (50) in Tehillim and increase achdus as a zechus for Shalom Mordechai Halevi ben Rivka. Reb Shalom Mordechai’s attorney, Guy Cook, said they will appeal the decision. Reb Shalom Mordechai, 50, was immediately taken into custody. A decision will be made Nov.=ember 18 on whether Rubashkin can post bail. A sentencing date was not set. Reb Shalom Mordechaihad been offered a plea deal by federal prosecutors prior to the start of the trial, but told supporters that he would not accept because he was innocent, a close family friend told The Des Moines Register today. Rabbi Shea Hecht, chairman of the National Committee for Furtherance of Jewish Education, said Reb Shalom Mordechai’s supporters urged him to take the offer, which would have included prison time. But the Rubashkins had “moral problems” with the proposal and insisted that he had done nothing illegal, Hecht said. The plea-deal conversation took place during a meeting with Reb Shalom Mordechai and his lawyers in Crown Heights, Hecht said it happened shortly before Yom Kippur. Hecht said Reb Shalom Mordechai’s legal expenses have already exceeded $1 million. 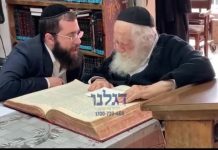 Rabbi Pinchos Lipschutz, publisher of Yated Ne’eman, has spearheaded an effort to raise funds and assist Reb Shalom Mordechai. Those who are aware of the details of the case have said that the ruling is a complete injustice and a blood libel in every sense of the word. Cook declined to comment about the plea-deal. The five-man, seven-woman jury began deliberations on the case Monday afternoon after a nearly month-long trial with more than 60 witnesses and reams of financial documents. They continued deliberations on Tuesday, had Wednesday off in observance of Veterans Day, returning today. The jury returned to the courtroom at about 4:40 p.m. today. Reb Shalom Mordechaistill faces 72 immigration-related federal charges as well as state allegations that he violated child labor laws. The federal immigration trial is set to begin in December in Sioux Falls. Agriprocessors Inc. was the site of an unprecedented May 2008 immigration raid that led to the arrest of 389 immigrant workers. Reb Shalom Mordechai was first charged in late October 2008. This is a Torah news site. To the dozens of commenters who wish to know why their comments have not been approved, this is not the place to spew your lashon hara and vendettas against frum people, Torah communities, or the Rubashkins. You can find elsewhere on the Web to do that. The success of this site is not based on the number of comments we receive but on the quality of our reports and the standards to which we hew. Watch out! The fact that this jury decided as it did, is indicative of where the entire American society stands concerning Jews. Thank you for being the only site to accurately report on this heart wrentvhing story of a modern day witch hunt and blood libel. You didn’t get it first but you got it right. Notwithstanding the great Tzaar for all of K’lal Yisroel from the suffering of such a wonderful Yid, we should not hurl phrases like “injustice was served” which is very inflamatory. If you mean that they reached the wrong result, that is different than “injustice was served” which really attacks the integrity of the judge, the jury, the prosecutors, and really villifies the American system of justice. This is, excuse the expression, an Al Sharpton type of approach and it is very counterproductive. And Matzav keeps on lying to the guillable faithful…. Get a LIFE!! Trust me Hashem has spoken and he is not happy with your reporting! You further the Chillul Hashem by saying he is innocent!! Matzav, you disappoint me in this article. You should immediately remove that headline, it is not helpful to anyone. This is not a blood libel. It is the law of the land that we jews choose to live in. No matter how good a person SMR is, he has been found guilty by a jury in a court of law. Your headline smacks of contempt of court. Oy Oy Oy my heart cries out for this man and his family. May we see a sppedy Yeshuah for him. anon watch your language-what’s wrong with saying the truth. He is a messenger of hashem putting chicken and meat on many tables including mine. What an injustice. Thank you to YATED and MATZAV for being the only ones reporting this properly . IT IS A TRAVESTY! Blood libel? Let’s be careful with our language. Are we to compare this to the countless Jews killed in medieval times? That’s insulting to their memory and to the court systems here which are fair and just. To the assimilaters: remember that in 1934 the highest german court ruled against a Jews money “his racial characteristics make him non-human”. That was the law of the land. Those who feel a tremendous urge to stand up for the American System of Justice would be better served doing it at a different time – not when we see ??? ???? ?????! It is a time to cry and introspect and not dance on another Yid’s blood. This is a man, a husband, father, son. So many people will be hurt by the terrible outcome of this case. Yes, people, this IS a blood libel. There are plenty of businesses out there that hire illegals, so do all of you holy molys; your cleaning ladies, so ha!! on that one!. When SMR asked to be given a chance to review this fact, and abide by the government laws, he was not given that chance. So many other businesses are. Do you know why??? Simply because he is a frum yid. Why wasn’t the jury allowed to hear nice things that witnesses had to say about SMR? Why did the reshante Reade make them leave the courtroom? Why? Because she was afraid these nice things would sway their opinions. Tell me is that fair? Let me tell all you people, the governement and the judge had their minds made up before this trial began. They were our to get SMR, and guess what? This is not just against SMR; this is against shechita. Can’t you see? This is against all frum people not only SMR. Reshante Reade had no business being a Judge in this case if she ordered the raid lechatchila. That, in itself, is wrong. So, before anyone condems SMR, who is a Tzadik and might have done a few wrong things, think twice. And to all you people out there that are sticking up for this antisemitic act, you better watch your skin in your business. Today, it’s SMR,tomorrow it could cholila be Me or YOU. Yes, this is an act against all of the Klall. Open your eyes, and mind. Think before you post shtusim. Yes, this is indeed a blood libel, it is a pogrom. Rachmono Litzlan, the aibishter should have rachmonos. Don’t disagree with Bubby! She is more experienced and even though she may be a shvigger, SHE IS 100% RIGHT ON THE MONEY! Thank you Bubby for saying it for me! You said it the way it is! Please do/learn something in zechus of this. May HKB”H have rachmanus on them and may we be zoche to greet the ultimate geulah quickly! This is a message for each one of us, just that one brother is getting the brunt of it. How sad. For everyone with negative comments, please keep them to yourself. Even if you are positively of something, he is still a yid, and still our brother, and we must daven for a yeshua. Negative comments definitely dont help anyone. thank you. May Hashem correct this great injustice to an honorable man who has done so much good in the world. The court system should not make him into an example because of flawed enforcement of U.S. laws. Let the courts make an example instead of the terrorist at Fort Hood! If he admitted guilt during the trial (as reported by Matzav), why is this an injustice? I’m sure all of you who think this is justice and our great american system is perfect, where at the trial the whole time. otherwise how can the sa such comments. You can say a million times how fair the system is but it won’t mean anything untill you tell me how many times you sat on a jury. This is a blood libel. Yes a system is a system but it doesn’t mean it is justice. Yes we chose to live in this country with this system, but the system has major flaws, as we saw in this case. Can anyone tell me that before the judge was sworn into her job, there was a detailed check of her history to see her opinions? There is no person 100% perfect how can the judge be perfect? She had an agenda and we saw it clearly. A person facing over 1200 years in prison, and she still wouldn’t let the jury hear all th testimony? Whats so bad if he is foud guilty on only 20 or 30 of the 91 charges? Nothing! He will still end up in prison for the rest of his life. But for the judge, that wasn’t good enough, she had to make sure R’Shalom looked like the worst of the worst. A person by the name of Rockne Cole wrote a letter to Representative Lofgren regarding the Postville raids. She states in her letter that Judge Reade coordinated the massive raid including the plea deals, mass detention, roundup, and the sentencings of the illegal immigrants before they were even allowed representation. Can you say CONFLICT OF INTEREST?? Let us continue to Daven. We should all pack up and get out of this country galus! The American justice system doesnt work for us, it doesnt take into account the good that you do. You should get consideration for your generosity, number of children and if you are frum in addition to the crimes. SMR should have been able to play a promo video for the Jury showing all the good he has done, so they dont just see the evidence of the crime. Everyone hires Illegals, so what, they keep the lawn up. Id like to have three living in the junk above the garage. I only wish that the press would have been able to quote Roza Weiss saying something more profound like “my father is completely innocent and never committed any of the crimes he was found guilty of” instead of “we are Jewish and proud of it.” She has to go home to her husbands child molestation charges back in New York. He is a yid also, so for him Daven a little extra. I did not read the other comments yet. I’m sure that i am not the only one protesting your headline calling this a blood libel. With this label you foment hatred. The US is a medina shel chessed. He was judged to have broken the law. I Certainly he may appeal. If he’s innocent I hope he gets off. Many courts and juries have made mistakes before. That doesn’t mean it’s a blood libel. You are doing the libel against the good intentions of the govornment. its very sad to see Yidden being happy when another Yid gets the book thrown at him. If you google shirat devorah, and then check out the site, you will see how the world will be very different in a mere two weeks. All of Klal Yisroel needs a yeshua!! Keep the tefilos coming!! Why should a judge ask a jury to leave a court when nice things are being said about the accused person. The jury, according to law, has to listen to all sides of a case. Same goes for that so-called Judge Goldstone. How did he possibly allow a woman to be on his Commission who openly wrote an article AGAINST Israel before he started his enquiry? These judges need to look at Torah laws because they are totally unfit and very obviously biassed. What is sadder is the cheering and gloating of Failed Messiah who takes immense personal pride on making 10 children orphans and the mother a living widow. Others pain is his source of holliday. His glee is not limited to this sad incident. He is filled with shade.freud and rejoices at every sin or error of any Jew anywhere in the world, like an evil archangel bent on destroying, shaming and annihilating Jews. One has to wonder how a person gets so sick and twisted. We have seen the Jew Goldstone and the Gaza report, Jews for J, Neturay Karta in Iran, and Shmaya. Some of our worst enemies are our own. Blood Libel? For weeks we have been asked to daven for Mr. Rubashkin which I am sure many people did. He rejected a plea bargain because he had emunah that things would work out in his favor. Now that the jury has found him guilty of the crimes he committed it is a blood libel? What happened to our emunah and kol d avid rachmanah l’ tav avid? Does this only apply when we get our desired outcome but otherwise it is the fault of the anti Semitic jury and court? I agree that this is NOT a blood libel. I maintain that good Jewish news sources can project their soul without hyperbole. Witch-hunt I have no problem with. That said, I had been davening that the ultimate outcome be a kiddush Hashem. I have no doubt there will be a great kiddush Hashem, looking at how R’ SMR has been comporting himself so far. Let’s all daven for a HAPPY kiddush Hashem. To those who keep saying he will get sentenced to life or 1200 years etc: That will not happen. There are formal sentencing guidelines. For bank fraud and these other charges, the length of the sentence depends primarily on the amount of the intended loss to the bank/victim. It seems from the reports that the bank had no loss; he repaid it all; he never intended to steal anything but diverted receipts for a short time and lied to get a bigger credit line which he paid off. If that is shown, he may get 4 or 5 years. People talk about 1200 years because that is the total if you add up all the Maximum penalties on all charges and run them consecutively. When charges like these(wire fraud, mail fraud, bank fraud) all stem from one criminal endeavor, the charges have to be grouped together and run concurrently, not consecutively. Unfortunately, he will be in jail for a while, but not for life. And he has another trial coming for the immigration matter, which may be consecutive if the judge wants to. But there is always the appeal. Bottom line: there is hope he will be reunited with family in the not too distant future. I contributed to his legal fund; why don’t you? Assuming Mr. Rubashkin is absolutely innocent of all charges, this is a miscarriage of justice; a far cry from a blood libel. My heart goes out to him and his family, and I daven that he should have a successful appeal, but to compare this to an intentional plot with the goal of killing large number of Jews demeans the term “blood libel”. Let’s not forget Jonathan Pollard as well, who will G-d forbid begin his 25th year in prison on November 21st. Call you Senators today, and every day until they let him go!!! There is a true miscarriage of justice- Jonathan never had a trial!!!! Thank you to the Editor of Matzav you have it 100% right we are in golus and until moshiach comes (which we hope & pray that he will come speedly in our days) there is an halocha beuodua ‘that Eisov soneh Lyaakov’ but the problem here is that the left leaning jews Reform & conservetive had an interest to close this plant down they were behind this arrest and they are still involved ‘they hate frum jews’. All these wondeful people who write that this is the will of hashem – if a person sins does that mean that is the will of Hashem a person has a choice they can do bad or good. This is an intentional plot. Open your eyes. We are in golus. This is an intentional plot to hinder and hamper schechita. This affects you too, unfortunately. This is an intentional plot against all frumme yidden. If this wasn’t, then Reshante Reade would not have been the judge in this case. What happened here is totally illegal. Yes, this is a blood libel. Many frum yidden have lost their parnossa and homes in Postville. What then is this???? a miscarraige of justice???? NO, it’s a blood libel. I guess you aren’t a child of surviors, so you don’t begin to understand. You have no idea. You will never really know. And I have no words left. I am stunned. I am shocked at some of the comments I have read here and in other posts. Tayere Yidden, if you can’t write something good then just don’t write. Remember: you don’t know who reads these posts. Special thanks to R’Pinny Lipschutz and Debbie Maimon. Pinny is the only one, with Matzav that has the courage to come out and speak up. #26: Where are you running to? 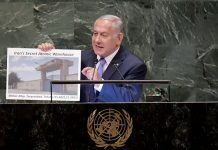 Is the Israeli gov’t any more on our side? We have the Arabs all around who want to destroy us lo aleinu! Actually, I am a child of survivors; that is why I have a problem comparing an injustice, which may very well come from anti-semitism, with a plan to eradicate the entire Jewish population. I am sure, if you think about it, you will understand why equating the two is offensive to me. Losing your parnossa, going to jail? All terrible, and, as I said, I daven R’ Rubashkin should have a yeshua. But my grandparents, aunt, uncles, siblings, would gladly have traded places whith him. Hitler didn’t give them that option. THank you #35 for your helpful post. Most of the comments here are simply inane. I do not know the details of the case and certainly reading these comments make me no more informed about whether this was a travesty of justice, a witchhunt, an on the mark ruling or a ‘blood libel’ since all that has been done is venting of feelings. Your post at least helped me understand that B”H SMR will not be sitting in jail for life which seemed to me harsh for crimes that hurt no one. 5 years seems to make sense for the offenses supposedly commited.